A simple apple turnover recipe made with store-bought puff pastry, filled with sugared apples, and coated in an easy glaze. After trying an apple turnover, make sure to give this apple crumble or this caramel apple cheesecake a try! Since I’ve known my husband, he’s always ordered an apple turnover whenever it’s been on the menu. After taking bites of the turnovers he’s had over the years, I’ve been determined to make him a better version at home. 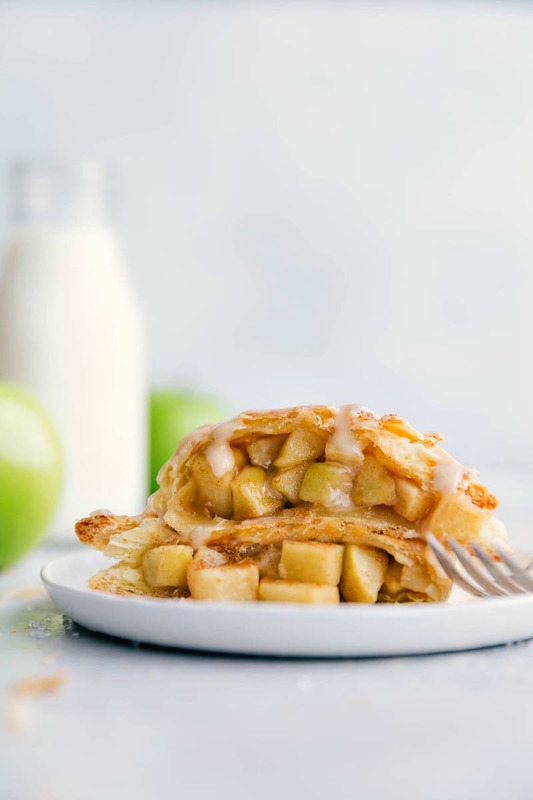 And this apple turnover recipe is just that — so much better than you’d find at any fast food restaurant! It’s soft, flaky, buttery, and best of all packed with cinnamon-sugared apples! How do you make turnover dough? While I love to bake (especially when it’s something my husband will enjoy), I’m not one to spend hours on making pastries, so we’re taking a shortcut and making these apple turnovers with pre-made puff pastry. Store-bought puff pastry is delicious and will save literally hours of prep time for this apple turnover recipe. That said, homemade puff pastry will work with this recipe! To make your own puff pastry dough, I recommend this recipe. How do you make apple turnovers? Dough: grab the puff pastry in the freezer section of your grocery store — generally by frozen pie crusts and pre-made frozen desserts. Apples: peel and core some tart apples (I recommend Granny Smith) and chop them into small pieces (no larger than 1/2 inch). Toss with a few ingredients and set aside. Assembly and baking: roll the puff pastry into a 12 x 12 square, cut into 4 squares, top with the sugared apples, fold over & seal, and bake! Glaze: whisk 3 ingredients (powdered sugar, vanilla, & milk) until smooth and drizzle on each apple turnover. What temperature do you cook turnovers at? I’ve found 400 degrees F is the perfect temperature to cook an apple turnover in. TIP: make sure your apple turnovers are COLD when going into the oven. I recommend chilling them for 15-20 minutes before baking. 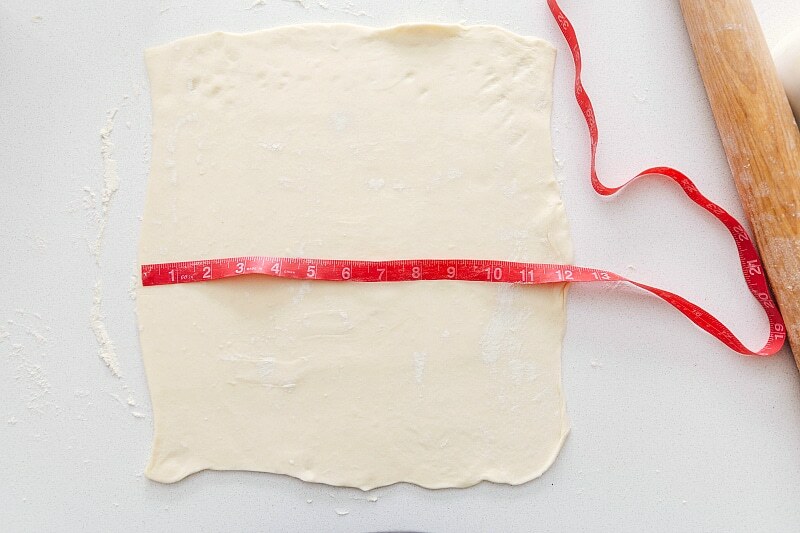 Use a ruler: when measuring the size to cut the puff pastry dough, I highly recommend a ruler for precision — it removes any guessing for how thick/wide you need to roll it out! Grab tart apples: the sugar and other ingredients added to the filling are depending on tart/sour apples. 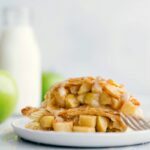 I recommend Granny Smith apples for this apple turnover recipe otherwise you might end up with overly sweet turnovers. Line your tray with parchment paper: no matter how well you seal your apple turnovers, some have the tendency to “leak.” Save yourself a whole lot of hassle and clean up and line your tray before baking! Can you freeze apple turnovers? Yes! 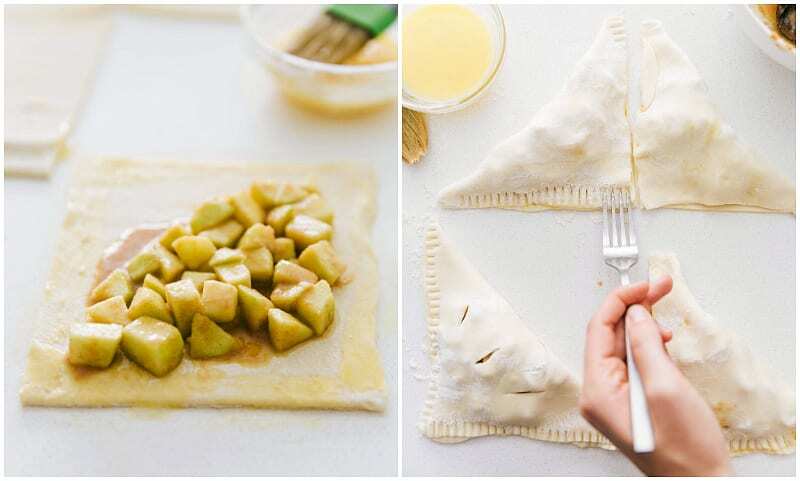 Completely prepare the apple turnover recipe and before brushing on the egg mixture or baking, freeze the turnovers (on the tray). Once the turnovers are frozen, wrap them tightly in plastic wrap and the place in an airtight freezer bag. While this recipe is quite different from Ina Garten’s apple turnovers, I don’t have a video (yet) for this recipe, so you may find it helpful to watch her create them. 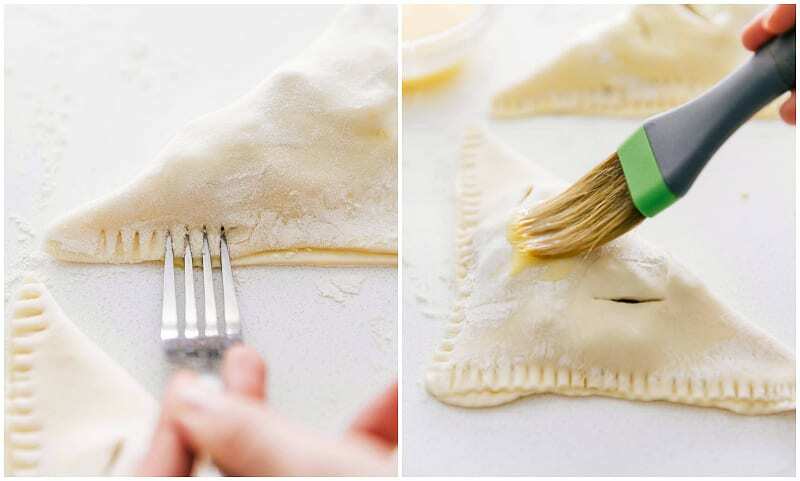 Thaw the puff pastry completely in the fridge. 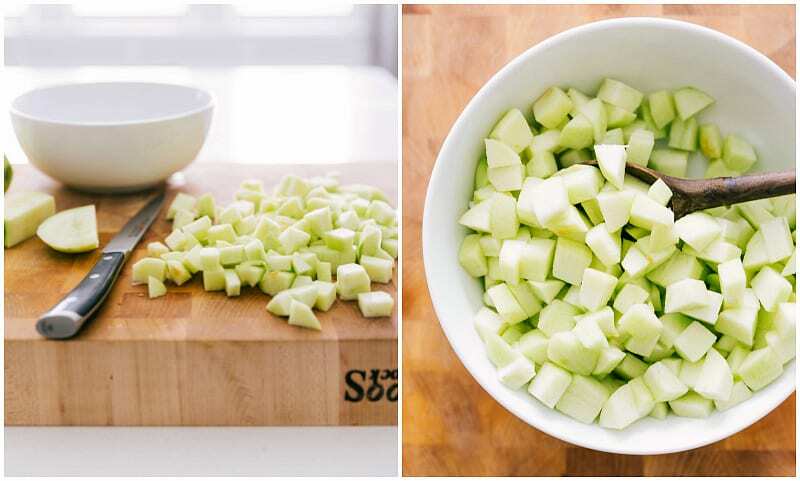 Prepare the apples by peeling them, removing the core, and chopping them into small pieces, no larger than 1/2 inch. 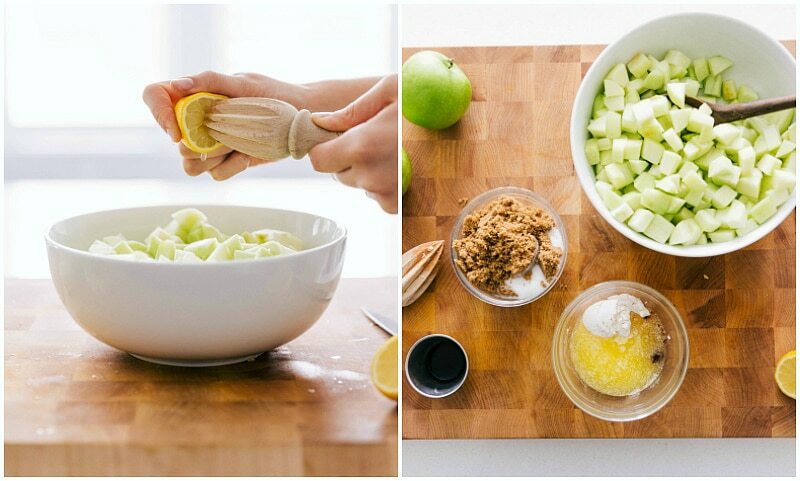 Toss the chopped apples with the lemon juice. In a medium-sized bowl, whisk together the melted butter with flour to create a thick paste. Mix in the white sugar, brown sugar, cinnamon, salt, heavy cream, and vanilla extract. Stir until smooth. Pour over the prepared apples and gently toss to coat. Preheat the oven to 400 degrees F. Unfold the thawed puff pastry onto a lightly floured surface. Roll each piece of puff pastry into a 12 inch by 12 inch square (use a ruler if you have one!). Cut each 12 x 12 piece into 4 equal sections. 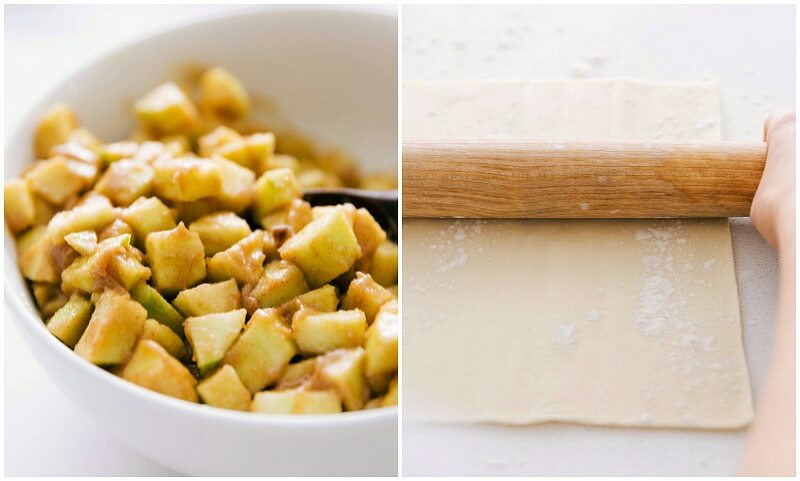 Place a packed 1/3 cup of the apple mixture on top of each square of dough. Spread so the apples are in one even layer on the bottom third triangle of the dough (see photos in post). In a small bowl, whisk the egg with the water to create an egg wash. Brush that egg wash around the entire square of dough and then fold over one corner to the opposite corner. Using a fork, crimp the edges making sure they are all well sealed. Brush the egg wash over the entire pastry. Use a knife to cut 3 small slits in the top of the pastry. If desired, sprinkle a teaspoon or so of coarse sugar over each pastries. Alternatively, you can sprinkle a mixture of cinnamon sugar over each pastry. Place the pastries on a parchment lined sheet pan (line your pan to avoid a mess!) and into the fridge for 20 minutes (it's very important they go into the oven cold). Place the turnovers on baking sheets and bake for 15-18 minutes or until lightly golden brown. While the turnovers are baking, whisk together all of the glaze ingredients until smooth. If needed, add a little bit of milk to get a thinner consistency. Pour the glaze into a small plastic bag and cut off the tip. Pipe the glaze over the slightly cooled apple turnovers. Alternatively, spoon the glaze over. Enjoy while warm! Do not try to toast these later, but you can microwave them for 5-10 seconds to warm them up at another time. To make your own cinnamon sugar: whisk together 1/4 cup white sugar with 1 tablespoon ground cinnamon. Exactly! The smaller the dessert, the more to eat 🙂 Thanks Rochelle! MMMMMMMM Apple turnovers are the yummiest! Especially when they are this easy…it makes them taste better when you don’t have to spend 4 years making them! Love these girl, hope you had a great Easter! Pinned! I love apple turnovers- these look amazing! Awwwwww … everybody needs a friend like Grace! Aren’t they just the best?!?!? And lucky for us, she needed this recipe … and now we all get to enjoy it! Yay! (Thanks, Grace! :D) Looks so delicious and so easy, too! You make some of the cutest food I’ve ever seen. Of course I want to try these! Pinned! These look so tempting with the glaze on top! Scrumptious! Mmmm I love pastries like this! And with that glaze and the sweet apples …. these look so good Chelsea! I hope that you had a wonderful weekend! These look so flakey and delicious! She sounds like a great friend! Go Grace! Seriously though, thanks Grace for bringing these beautiful apple turnovers into existence and making my mouth water. These look delicious, Chelsea! Brava! There’s no better gift than a great friend, it sounds like you guys are lucky to heave each other! I’m sure she will love these!! I know I do! So, so true! Thanks Nicole! My family would LOVE these! 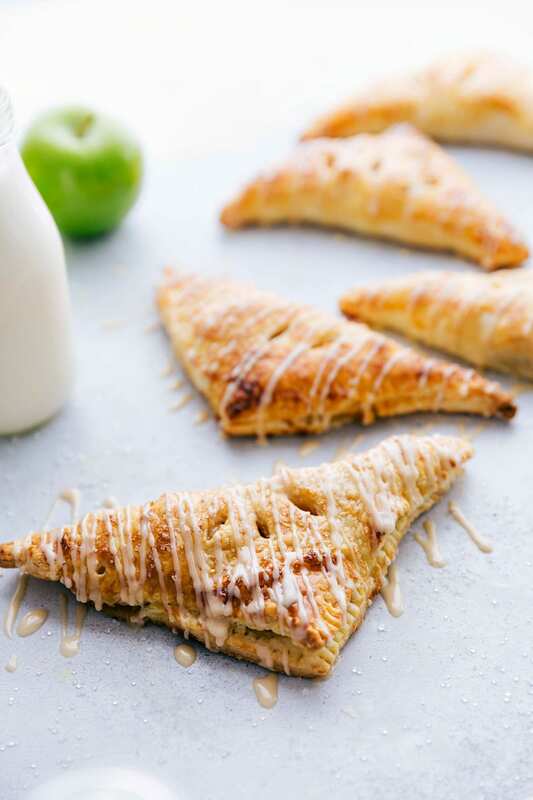 Turnovers are so fun to make and eat and apples are our favorite filling. Your drizzle is so gorgeous! I remember when I made chocolate croissants the Julia Child way with my best friend. It. took. hours. So I’m happy to see an alternative to the tedious dough! These look delicious and how sweet that your friend asked you for a recipe; it’s such a compliment! I’m glad Grace gave you the inspiration for these, because they look delicious, Chelsea! I love anything in mini form, especially when it comes to pies and cheesecake. 🙂 YUM! I am obsessed with miniature 🙂 Thanks Marcie! Yes, love that you dedicated a post to your friend. So sweet. And these turnovers, oh my goodness they look amazing! 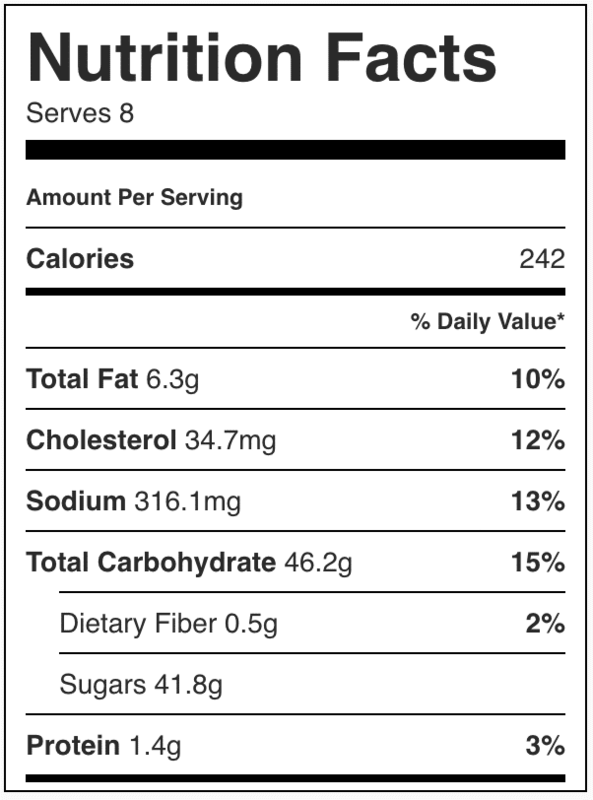 I’m a fan of apple anything… and did you say this could be eaten for breakfast?!?! Sign me up! Thank you Kelly! 🙂 It was such a fun time and we got to spend it with family 🙂 I hope you are having a great week so far! Everything is just so much better mini, in my opinion! Ok, maybe not everything, but most things. 😉 Like these mini apple turnovers! I heart them!! Pinned!